SANS Security Essentials course in Norwood, MA. I received my ID badge at registration and seven books for the week (one for each day + one for the bootcamp labs in the evenings). 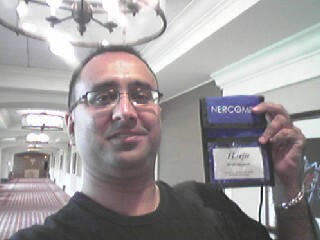 I'm staying at the Sheraton Four Points Hotel & Conference Center where the class is held. This is a great class but requires some major time commitment. Classes run daily from 9AM-5PM and then the bootcamp sessions from 6-8PM. So, you are pretty much wiped out by the end of the day.